Moving? I’m over it. Even it if is just out of the cottage for three-and-a-half months while our long, long-awaited extension is being built. Have you any idea how many cookbooks I have to pack up? In that picture is just two of the nine (and still counting) boxes that I’ve filled up so far. The Husband, who has to heft all these boxes up into the attic at the brewery, is even less impressed. On the plus side, my kitchen space will eventually be more than doubled so I’m hoping to have a gigantic set of shelves to house all these books where they belong: right beside me in the kitchen. On Saturday evening, fed up with a day of boxing and hefting various items around, I decided that Sunday was going to be treat time. Before anyone could protest, there was a phone call and a booking made: we were going to our favourite local-ish restaurant, O’Brien Chop House, for Sunday lunch. We arrived in Lismore early, happily, as there was a playground and farmers’ market to occupy both Little Missy and her mammy. The mammy was particularly thrilled when she managed to track down a big slice of mature Coolea to restock a nearly-emptied fridge. The Husband got his reward when we eventually sat down in O’Brien’s main dining area: a proper tankard of Dungarvan Brewing Company‘s Helvick Gold. The driver wasn’t left out either with a tall glass of homemade, tangy Rhubarb and Apple Fizz. One portion of the sweetest, smallest lambs’ kidneys and a whole roast sea bass with lemon and caper butter later – so delicious that I even followed my Malaysian uncle’s example and ate the cheeks (although I did draw the line at the eyeballs) – and packing was almost forgotten about. To give Little Missy a change of scenery, we moved to the snug out the front for a proper pot of peppermint tea and a shared chocolate fondant cake. Happy days, especially when there is the glory of Lismore Castle gardens for a small girl’s post-lunch run on a sun-drenched day. Packing? Ah, what packing? 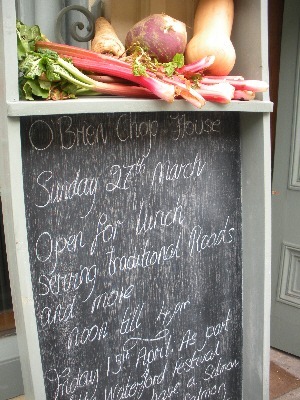 O’Brien Chop House is on the Main Street in Lismore, Co Waterford, online at www.obrienchophouse.ie and also on Twitter at @obrienchophouse . The traditional Sunday roast lunch is €24.90 for two courses, €29.90 for three. Watch out for the Irish Food Bloggers’ Foodies on Tour dinner in O’Brien Chop House on Friday, 15 April, as part of the Waterford Festival of Food. Take me with you next time? I’ve only managed to pack up 1 out of my 10 bookshelves and my builders are coming on Thursday! Having transported most (I thought) of my books from Ireland my friend clive brought out the remainder last month in his van. 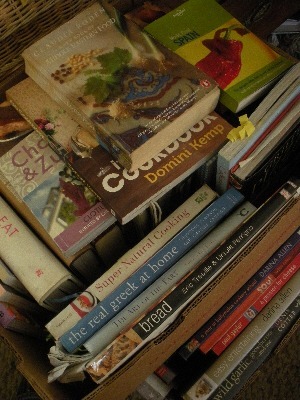 At this moment there are 18 boxes of books (lots of them cook books) in the cellar with nowhere to go. I’m going to have to show the Husband this comment, Martin – just make sure he knows how easy he actually has it!